The cornerstones of the Association’s efforts have been the Diversity and Cultural Competency Committee (DCCC) and its Cultural Competency Curriculum Guidelines Subcommittee (CCCGS). The DCCC was formed as a task force in 2005 and became a standing committee in 2011 with a vision of achieving diversity and cultural competence in optometric education and patient care. The committee has made great strides, including the development of cultural competency curriculum guidelines in 2008. The charge of the CCCGS was to facilitate and encourage implementation of the curriculum guidelines at the schools and colleges of optometry. The subcommittee met its charge and was discontinued in June 2015. ASCO wishes to acknowledge the many contributors to the DCCC and the CCCGS, as well as those who helped to lay crucial groundwork in the Association’s cultural competency and diversity efforts, all of whom have moved the needle forward in these important endeavors. Special thanks go to Edwin C. Marshall, OD, MS, MPH, FAAO, FNAP (Indiana University), who chaired the ASCO Diversity Task Force and the ASCO Cultural Competence Guidelines Work Group, Larry Davis, OD (UMSL), who chaired the DCCC over the past three years, and Barbara Fink, OD, MS, PhD (OSU), who chaired the CCCGS to implement training workshops at 18 schools and colleges of optometry. As you read this report, it is important to keep in mind that achievement and maintenance of cultural competency and diversity are continuous journeys. As such, the report serves as a signpost as we continue on this road. ASCO has recognized the need for diversity and cultural competency at its member schools and colleges of optometry. A task force to work towards these goals was formed in 2005. In 2011, the task force became a formal standing committee within the structure of ASCO. As a profession and an education community, we have made advances in the teaching of cultural and linguistic competence in our curricula. However, we have not formally reviewed the status of the diversity of the student body and faculty in our schools and colleges of optometry. Along with our colleagues all over the country, we recognize the importance of diversity. We realize it is a worthy goal to achieve, and that it begins with our student body. Many health professions, such as medicine, pharmacy, nursing and radiology, have created a call to action to increase diversity in their ranks.10-12 (See our recommended call to action for optometry below.) 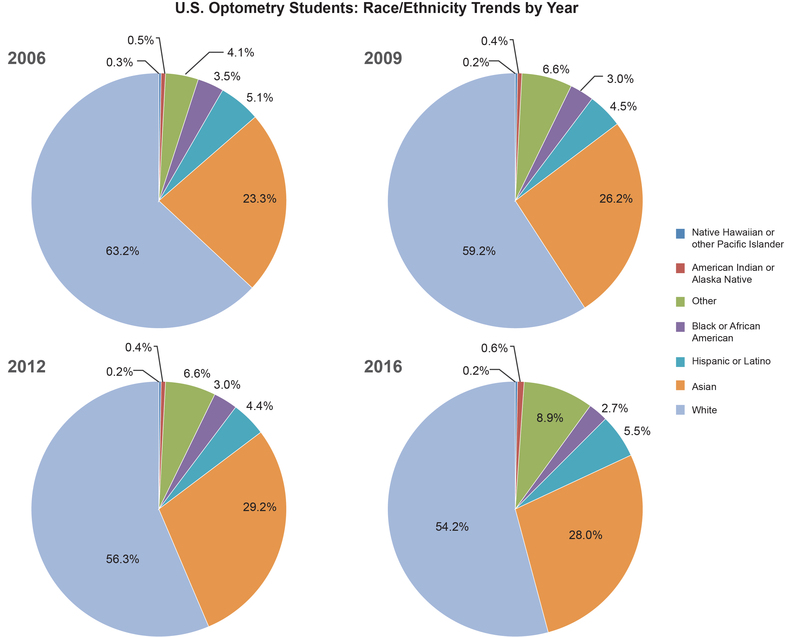 In order to diversify the optometry workforce, we must first examine and expand the racial and ethnic diversity of our student body and faculty. This report aims to review the data ASCO has compiled from its member schools over the past 10 years, which includes information about gender, race and ethnicity.14 The report examines trends, reviews current initiatives and recommends a call to action. 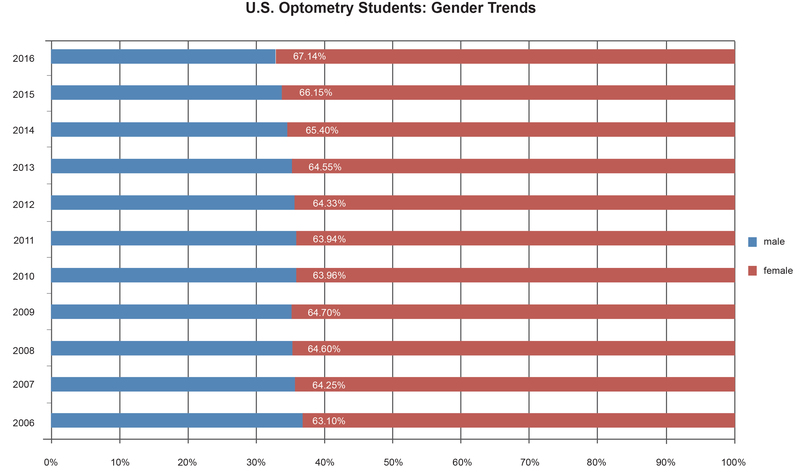 Data on optometry students and the United States population from 2006 to 2016 were obtained and analyzed as described herein.2,14 ASCO Student Data Reports are publicly available on the Association’s website. 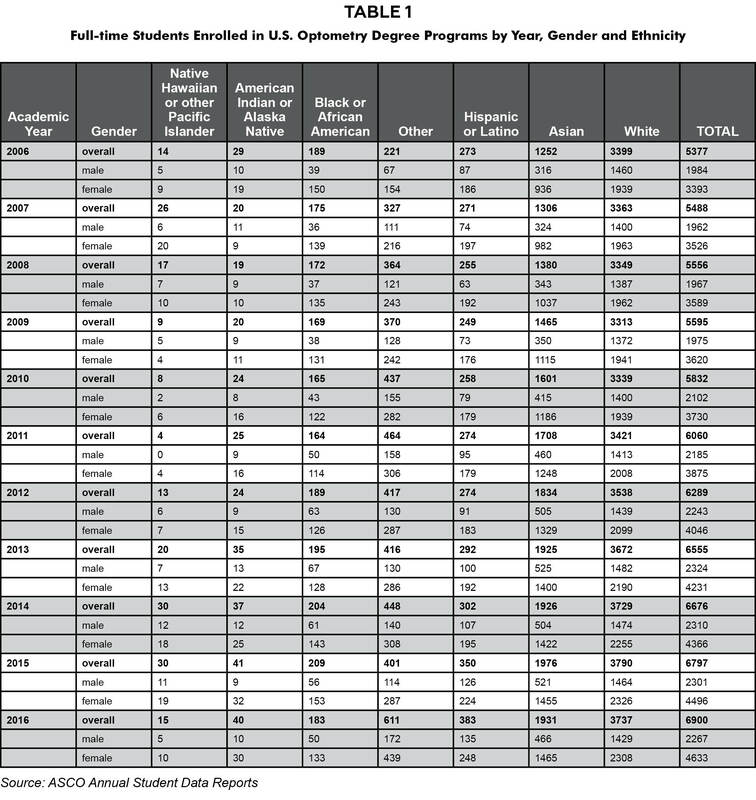 The reports aggregate data on enrolled students by male or female gender and ethnic identification as reported by each of 21 schools and colleges of optometry (Table 1).14 Ethnic identification is self-reported by students and is listed in seven categories: Black or African American, Hispanic or Latino, American Indian or Alaska Native, Asian, Native Hawaiian or other Pacific Islander, White, or Other. The gender and ethnic identification data from these reports were collated into spreadsheets by school and analyzed for trends over time. Additionally, the data were summed with descriptive statistics for all schools by year to analyze trends over time (Figures 2-4). In 2006, 5,377 students were enrolled in optometry school. By 2016, 6,900 students were enrolled in optometry school, an increase of 28.3% during this time period. In 2006 and in 2016, the majority of students were female, 63.1% and 67.1%, respectively. The number of female students steadily rose in that time from 3,393 in 2006 to 4,633 in 2016 (a 28.7% increase), while the number of male students remained stable until 2010, when slight increases started to occur (from 1,984 in 2006 to 2,267 in 2016, a 14.3% increase). In 2006, of the seven racial and ethnic categories to which students self-reported, 63.2% identified as White and 23.3% identified as Asian. 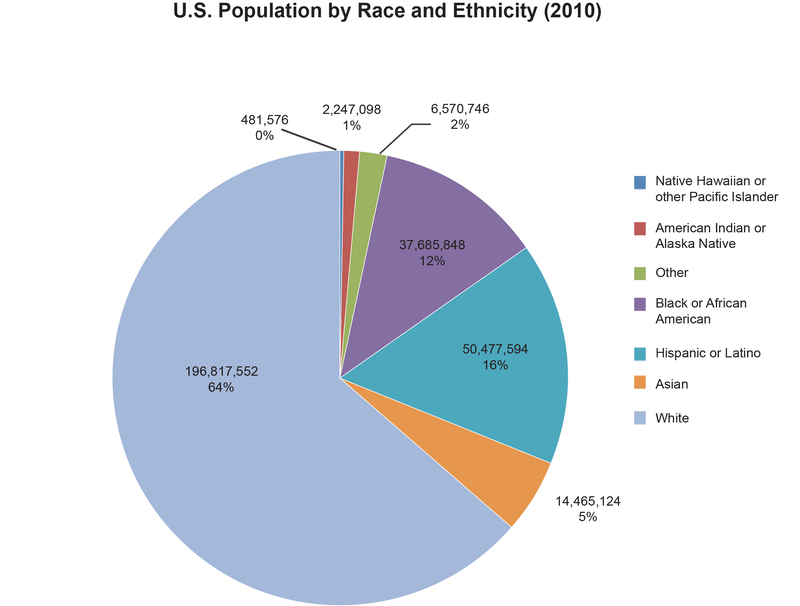 Other racial and ethnic groups, which include Hispanic or Latino, Black or African American, American Indian or Alaska Native, Native Hawaiian or other Pacific Islander, and Other made up (individually) 5.1% or less of the total. As of 2016, the largest percentage of the student body (82.2%) remained White and Asian. While the numbers of students identifying as Hispanic or Latino, Black or African American, American Indian or Alaska Native, Native Hawaiian or other Pacific Islander, and Other have generally increased, the percentage of students in each category has largely remained stagnant. There has been a decrease in the percentage of White students, from 63.2% in 2006 to 54.2% in 2016. However, the total number of White students had increased from 3,399 in 2006 to 3,737 in 2016. The only racial and ethnic category that has registered increases in the total number and percentage of students is Asian, from 1,252 (23.3%) in 2006 to 1,931 (28.0%) in 2016, an increase of 54.2%. In Academic Year 2016, ASCO added the category of Two or More Races to its Student Data Report, which changed the way students self-identified. For consistency, this new category was included in the category of Other for the purposes of this report. The category of Other has not exhibited a consistent trend throughout the years, which may be due to different interpretations by individual students. ASCO and its member institutions have embraced the concepts of diversity and multiculturalism in optometric education and in the profession. The Developing a Diverse Applicant Pool in Optometric Education Mini-Grant Program provided seed money for specific programs/projects that assisted schools and colleges of optometry with programs designed to implement educationally sound activities for recruiting and retaining under-represented minority (URM) students, financially disadvantaged students and first-generation college students. This 10-year project has opened doors for URM students but has made little impact on the overall diversity of the student body. It is clear that a single strategy will not create meaningful change. Optometry needs to approach the problem from multiple fronts. 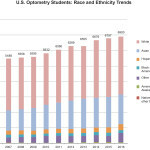 While most professions do not start recruiting potential students until high school, ASCO should consider developing programs that introduce young minority students to optometry as early as middle school and continue throughout high school. This is an ideal opportunity for ASCO to partner with state and local optometric organizations to develop outreach programs that could be deployed in communities with large minority populations. The diversity mini-grants have yielded success in a number of schools and colleges of optometry, and consideration for a national program should be on the agenda. Nursing includes several examples of pipeline strategies that have increased the number of minority students recruited out of high school who successfully complete nursing programs.18 Recruiting strategies that target undergraduate college students are also valuable. 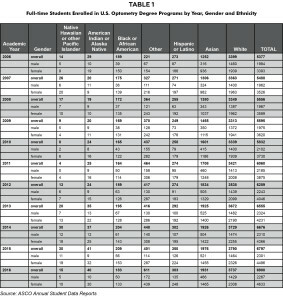 Unfortunately, studies indicate that female and minority students are less likely to consider a career in the science, technology, engineering or math (STEM) fields and are more likely to change majors in undergraduate school.19 Minority students often start STEM majors facing additional barriers when compared to their White peers. Some colleges and universities are developing programs to address these barriers with the hope of creating a larger pool of minority applicants for graduate and health professions programs.20 The best students are being recruited by multiple programs. Individual schools of optometry might consider the feasibility of early admission for promising undergraduate students. The benefits of a racially and ethnically diversified student population are numerous and have been outlined in this report as well as landmark white papers from the Macy Foundation21 and the Sullivan Commission.4 Diversification is not a quota that needs to be filled, but an area of excellence that requires a commitment from each school and college of optometry. Leadership is needed not only from our schools, their Boards of Trustees, senior administration, faculty and staff, but also from the profession as a whole. The applicant pool is stagnant, and each school and college is competing for the same group of students. Addressing the diversity gap not only moves the profession forward, but helps to enrich the applicant pool. Nonetheless, this commitment needs to be a part of the culture and fabric of our institutions. In order for the profession of optometry to be diverse, change is required immediately. A diverse student body is the beginning of a diverse optometric workforce, which will also lead to diverse optometric leadership for the profession. ASCO has made a commitment through the development of a cultural competency curriculum. Fourteen of its 23 member schools have participated in cultural competency curriculum implementation workshops. Many schools have explored pipeline programs through the ASCO diversity mini-grant program. However, these activities have produced only local change. They have not translated to significant change holistically, as documented in this paper. A high commitment needs to be embraced. 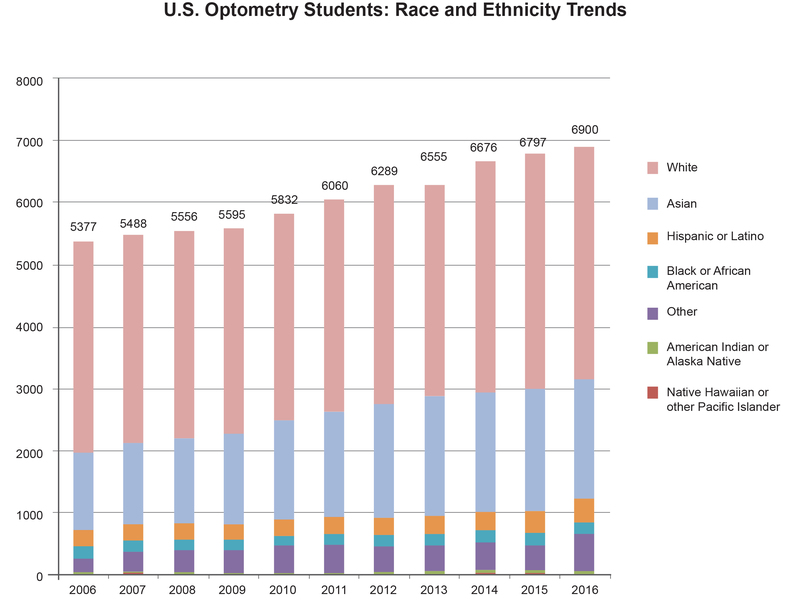 Optometry’s diversity can no longer afford to be different than the diversity of the U.S. population. Diversity is a strength and asset to the profession. We can learn from other health professions (medicine, nursing, etc. ), AMPAS and Fortune 500 companies. 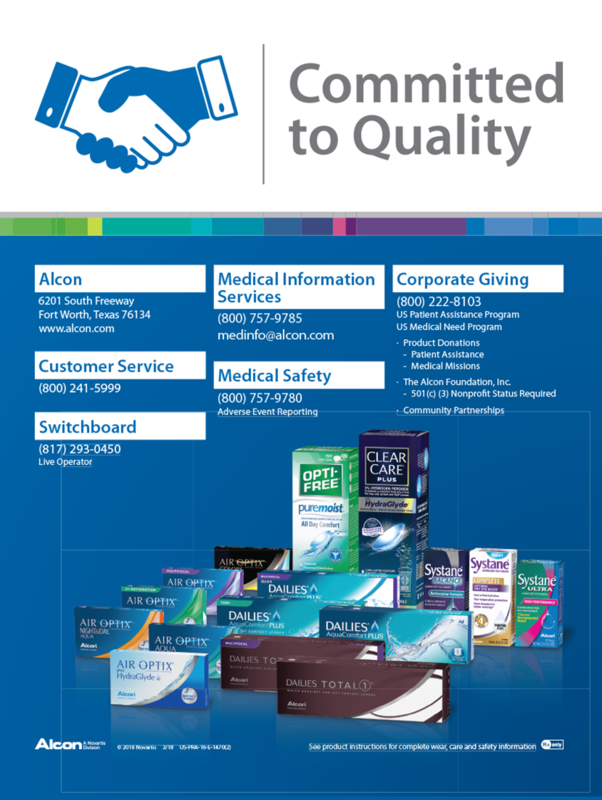 Excellence in diversity will lead to happier patients, doctors and staff. This will take time, as do all investment portfolios. When we start, compounding will take place, and, in a matter of time, we will reap the benefits of our actions. To increase diversity and the numbers of URM students who graduate from the schools and colleges of optometry, action is required. We recommend the following call to action for ASCO and its member institutions. Merriam-Webster. Accessed Jan. 2, 2017. Available from: https://www.merriam-webster.com/dictionary/diversity. 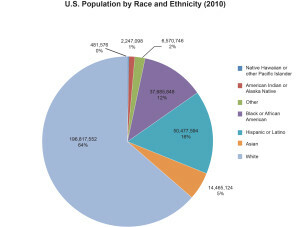 United States Census Bureau, 2010. Accessed Oct. 17, 2017. Available from: https://www.census.gov/2010census/popmap/. The U.S. Health Workforce Chartbook, Part II: Clinicians and Health Administration, U.S. Department of Health and Human Services, Health Resources and Services Administration, National Center for Health Workforce Analysis, 2013. Sullivan LW. Missing Persons: Minorities in the Health Professions, a Report of the Sullivan Commission on Diversity in the Healthcare Workforce. Institute of Medicine (IOM). (2003). Unequal Treatment: Confronting Racial and Ethnic Disparities in Healthcare. Smedley BD, Stith AY, Nelson AR, eds. Washington, DC: National Academy Press. Basch CE. Healthier Students are Better Learners: A Missing Link in School Reforms to Close the Achievement Gap. Equity Matters: Research Review No. 6, Columbia University, March 2010. AOA Community Health Center Committee, Prosener M, Shin P. The role of community health centers in responding to disparities in visual health. Optometry. 2008;79:564-575.
Cooper LA, Powe NR. Disparities in Patient Experiences, Health Care Processes and Outcomes: The Role of Patient-Provider Racial, Ethnic, and Language Concordance. Commonwealth Fund Report, July 2004. Lightfoote JB, Deville C, Ma LD, Winkfield KM, Macura KJ. Diversity, inclusion, and representation: it is time to act. J Am Coll Radiol. 2016;13:1421-1425. Valentine P, Wynn J, McLean D. Improving diversity in the health professions. NC Med J. 2016;77(2):137-140. Relf M. Advancing diversity in academic nursing. J Prof Nurs. 32:S42-S47, 2016. Xierali IM, Nivet MA, Wilson MR. Current and future status of diversity in ophthalmologist workforce. JAMA Ophthalmol. 2016;134(9):1016-1023. Annual Student Data Report. Association of Schools and Colleges of Optometry. Assessed Sept. 2016. available from: http://www.opted.org/student-data-reports/. McGrit E. Google searches its soul. Fortune. Feb 2017:50-56. Academy of Motion Picture Arts and Sciences. Academy takes historic action to increase diversity [press release]. Los Angeles, CA: Jan. 22, 2016. Rottenberg J. Idris Elba, Emma Watson, Ice Cube among 683 invited to join the movie academy — the largest, most diverse class ever. Los Angeles Times. June 29, 2016. Accessed July 25, 2016. Available from: http://www.latimes.com/ entertainment/envelope/la-et-mn-new-academy-members-20160629-snap-story.html. Murray TA, Pole DC, Ciarlo EM, Holmes S. A nursing workforce diversity project: strategies for recruitment, retention, graduation, and NCLEX-RN success. Nurs Educ Perspect. 2016;37(3):138-143. Kokkelenberg EC, Sinha E. Who succeeds in STEM studies? An analysis of Binghamton University undergraduate students. Econ Educ Rev. 2010;(29):935-946. Lee DM, Harmon K. The Meyerhoff Scholars Program: changing minds, transforming a campus. Metropolitan Universities. 2013;24(2):55-70. Increasing Diversity in the Health Professions: Recommendations to Improve Title VII of the Public Service Act. Report of a summit convened by the National Hispanic Health Foundation and the Josiah Macy, Jr. Foundation. June 2009. Accessed Feb. 17, 2017. Available from: http://macyfoundation.org/docs/grantee_pubs/NHHF-Macy_PHSA_Recs.pdf.